Published Aug 4, 2015 by Addison-Wesley Professional. Part of the LiveLessons series. Effective Python LiveLessons Video Training offers developers insight into the Pythonic way of writing programs, building on the viewer’s fundamental understanding of Python to help him or her write programs more effectively. 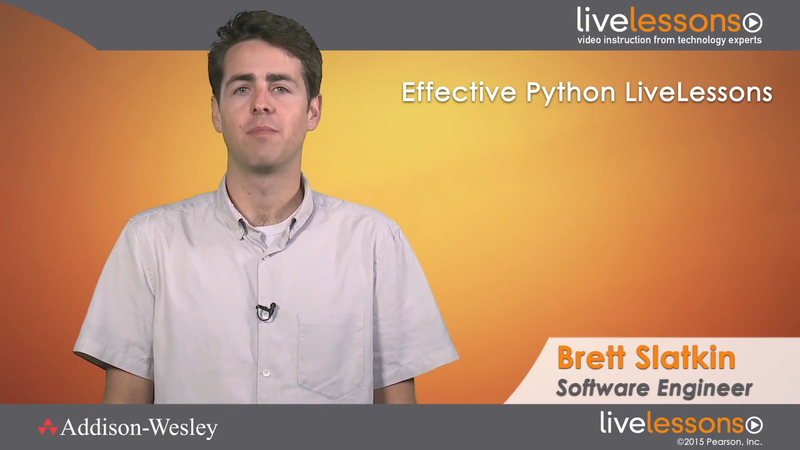 Effective Python LiveLessons Video Training is based on the book Effective Python written by Google software engineer Brett Slatkin for the Effective Software Development Series. Each lesson contains a broad but related set of items. Each item is designed to provide concise and specific guidance on what to do and what to avoid when writing programs using Python. Hands-on demonstration helps the viewer understand how to put each item into action. Each of the video’s six lessons includes items focused on a key topic. The video starts with items focused on how to make more efficient use of expressions and statements before moving on to lessons that teach viewers how to better use comprehensions and generators, functions, and classes. Next, the training teaches viewers how to solve problems associated with concurrency and parallelism. Finally, the focus switches to how to make Python programs more robust. After watching this video, Python programmers will have the knowledge necessary to really master the language and apply the advice, tips, and tricks learned from the video to the Python programs they’re writing, immediately improving the quality of their code. Advanced programmers who have a history of programming professionally but are now using Python for a real project. Intermediate programmers who have just learned how to program for the first time using Python and want to gain skills to become more advanced programmers. Non-professional programmers who use Python as part of their jobs. These people have a good working knowledge of Python but are probably missing important fundamentals that would make them more effective. In the first lesson, you learn how to write programs in the Pythonic style, using methods that will affect every program you write. In Lesson 2, you learn how to use comprehensions and generators to work with and create sequences of values. Lesson 3 covers a wide variety of unique capabilities that Python has for writing and calling functions. The focus of Lesson 4 is how to put Python's object-oriented capabilities to good use while at the same time avoiding common pitfalls. Lesson 5 provides you with insights into Python's built-in facilities for writing programs that do many things at the same time. In the final lesson, you learn the best techniques for making sure your programs are bulletproof when they run in production. The source code repository for this LiveLesson is located at https://github.com/bslatkin/effectivepython/blob/master/VIDEO.md.